I have always wondered what it would be like to travel to Disney World when it was not at peak travel times. Since my husband and I are both teachers, we usually travel during the busiest (read most expensive) times to travel. As luck would have it my son's school had a three day weekend for Mother's Day 2016. We took advantage of this rare holiday in early May & booked a vacation to Disney World. I have to say it was a great Mother's Day gift! First we had to decide how we would get there. Time was a big constraint on our trip. We live 17 hours from Orlando, it would not be feasible to drive to Disney on a three day weekend. So it was decided we would have to fly. 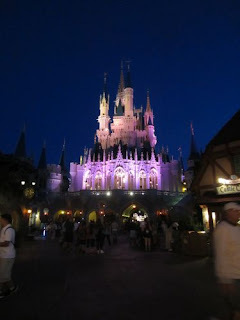 For several months I had been researching airfare to Orlando for weekends throughout the spring. Therefore I had a pretty good idea how much airfare cost & could recognize a deal when I saw one. 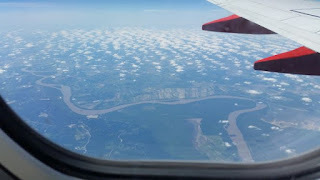 I used Google Flights & Southwest Airlines to research airfare prices. Here are a few things I learned about airfare while researching prices. First airline ticket prices fluctuate constantly. The time of day you look at airfare prices & the day of the week effected the cost of the ticket. For example if I searched for airfare on a Tuesday morning it was considerably cheaper than the SAME flight if I looked it up on a Friday afternoon. I ended up booking our flight with Southwest on a Saturday morning. By that afternoon the price of the ticket had increased $50 for the same flight. When I checked the same flight again on Sunday morning the price had dropped once more. Flying out on a Friday & returning on a Sunday would not fit into our budget as typically those are the two most expensive days to travel. We ended up flying out of Dallas Love Field on a Thursday evening at 7:15 PM. We arrived in Orlando by 10:30 PM & took Disney' Magical Express from the airport to our hotel, Disney's Port Orleans French Quarter. We arrived at the hotel at midnight & quickly got our room. 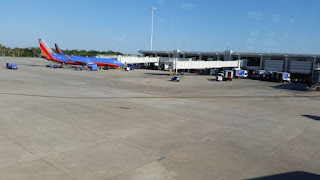 Our return flight was Sunday morning at 10:50 AM putting us back in Dallas by noon. 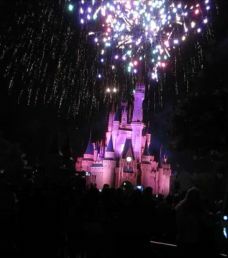 This gave us 2 full days to enjoy Disney World! Next we had to choose where we would stay... There are many choices for hotels in the Orlando/Disney World area. In years past we have stayed on Disney property & off Disney property. 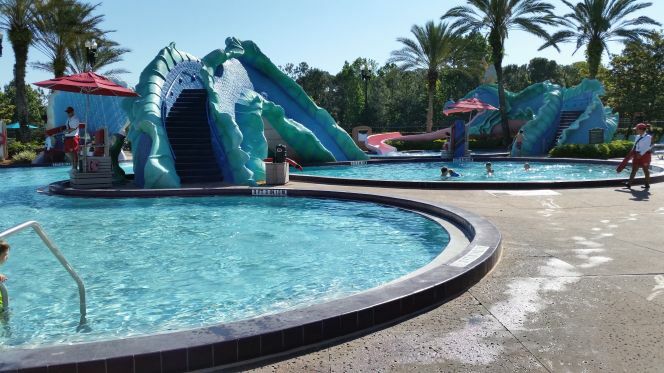 We prefer to stay on Disney property in a moderate resort. French Quarter is we really enjoy the boat service to Disney Springs. 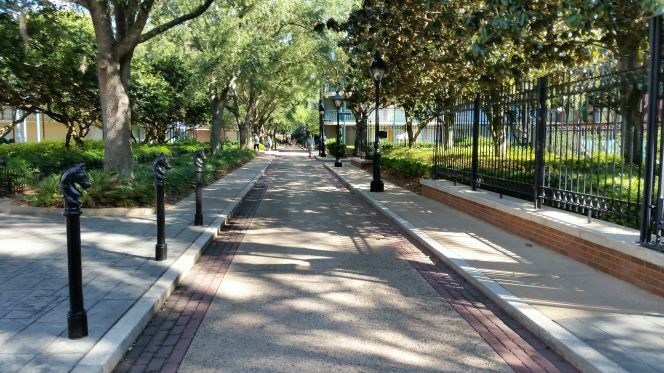 We also like that the grounds are beautifully landscaped to have the look of New Orleans' French Quarter. Jazz music plays in public places to add to the ambiance. Room choices include standard, garden, & river views. 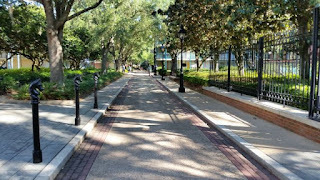 At the French Quarter no room is more than 5 minutes walk from the main building/pool area, boat launch, & bus stop. There is only one bus stop at French Quarter making the ride to and from the theme parks faster. 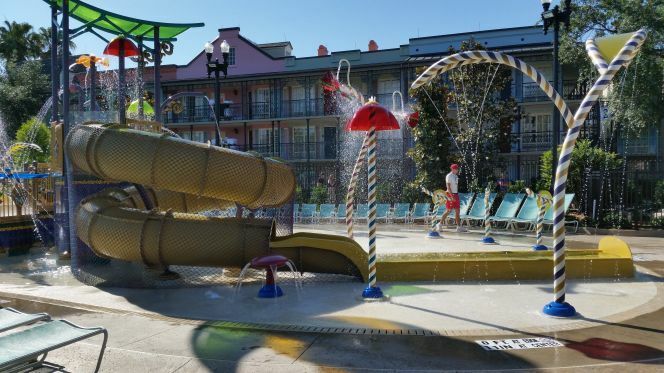 In addition French Quarter has it's own bus service to and from the theme parks so you do not have to share a bus with another resort like the All Star resorts. 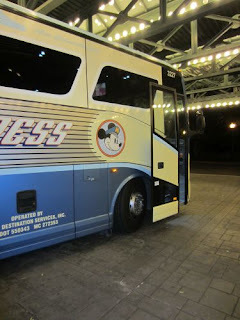 In the past when we have stayed at Port Orleans Riverside there were multiple bus stops that we had to go to before our bus dropped us off or picked us up for the theme parks. This was a BIG waste of time. On more than one occasion we have ridden the French Quarter bus from the theme park & then walked to our room at Riverside because it was faster than waiting on the crowded bus for Riverside. The bus system at French Quarter is better than Riverside. We have stayed at Port Orleans Riverside twice before & liked the resort except for one thing, PORT ORLEANS RIVERSIDE IS HUGE! 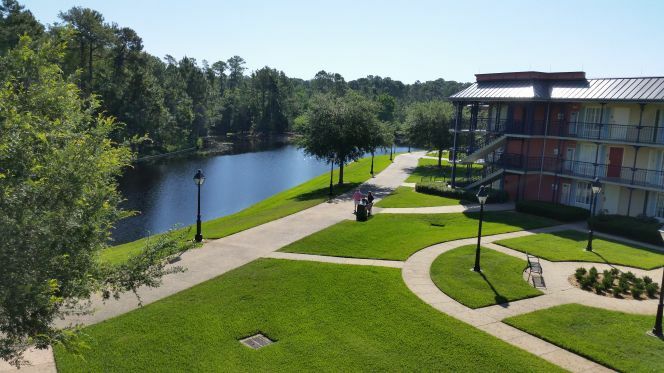 The first year we stayed there we were in Alligator Bayou as far from the main building as you can get, Building 37! Our walk to the main building took no less than 10 minutes to get there. The grounds were beautiful but it was a long walk. The second trip we stayed at Riverside I did a little research and learned how to request a room that was in my price range but closer to the main building. 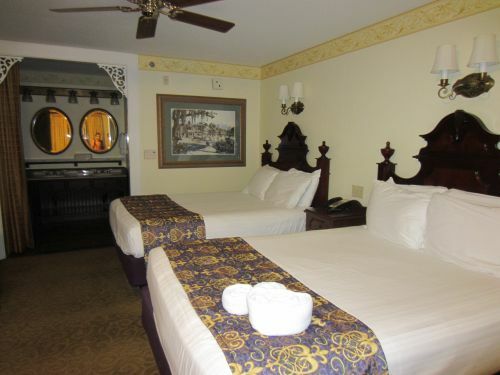 If you would like to know how to request rooms at Port Orleans click here. It really does work because the room we stayed in on our second trip to Port Orleans Riverside had a great location! 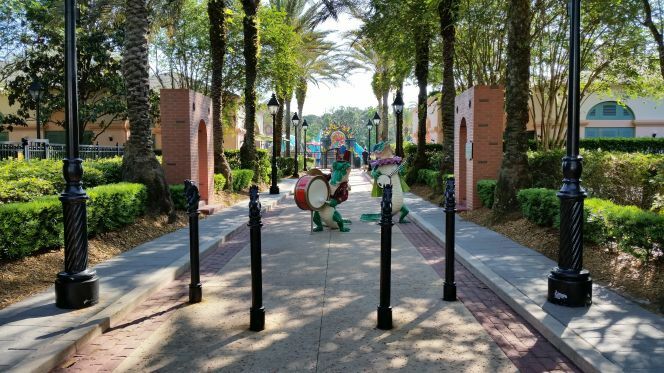 Of all the hotels we have stayed in at Disney World, Port Orleans French Quarter is our absolute favorite. Next we had to decide the best possible use of our 2 days at Disney World. Being ever budget conscious, money was a huge factor in choosing how we would spend the limited time available at Disney World. Since we had visited Disney World 4 times previously, we had a better idea of our choices. This helped in the planning process. 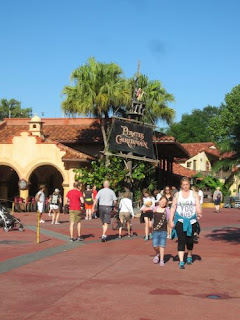 After looking at many variations of our two day trip we decided to spend one day at Magic Kingdom theme park & one day at our hotel & Disney Springs (formerly Downtown Disney). At Disney World it is quite expensive to visit a theme park for one day, the more days you visit the cheaper the daily rate becomes. But we did not have time to visit for longer. Therefore our 1 day ticket to Magic Kingdom was $110 per person. If we had selected to visit Epcot, Animal Kingdom, or Hollywood Studios the daily rate was slightly less expensive at $102. If you wish to add park hopper to your one day ticket it costs an additional $50 per ticket. We chose Magic Kingdom over Epcot, Animal Kingdom, & Hollywood Studios because as of May 2016 it offered more entertainment for the money. We did not choose Epcot because Soarin' (one of our favorite rides) was closed for refurbishment. Also, as of April 2015 Innoventions West closed permanently at Epcot. In addition, the "Frozen" themed ride in Norway is not open as of May 2016. A final reason we did not select Epcot is when we visited Summer 2015 on a Saturday night there were more drunk people in World Showcase than there were sober people - not really family friendly. 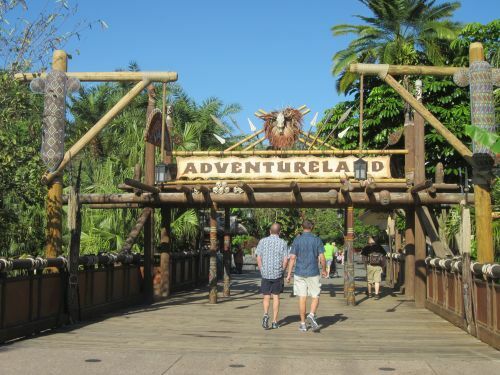 We did not select Animal Kingdom because as of May 2016 the closing time for Animal Kingdom was 6 PM and we would not have felt as though we were getting our money's worth. We did not select Hollywood Studios because everything past Toy Story Mania! is closed permanently. Hollywood Studios is undergoing major renovations & the entertainment offerings are limited. Magic Kingdom Main Street at rope drop. 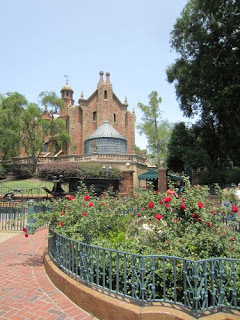 Once Magic Kingdom was selected, our next choice was which day to visit the theme park. You can find crowd meters online that will give you an idea of expected crowds based on historical information. Our choices were Friday or Saturday since we had to fly home Sunday morning. Friday was selected because we knew Magic Kingdom would be crowded on the Saturday of Mother's Day weekend. Especially since the weather that weekend had high temperatures around the 80 degree mark with humidity at 40% - which is unheard of in Orlando on the trips I have been on in the past. As luck would have it Magic Kingdom had Extra Magic MORNING Hours that day. We prefer Extra Magic Morning hours to evening hours because we are early risers. However, it was very difficult to get up at 6 AM after not getting to our room until midnight the night before. But it was Disney and the "magic" got us up & kept us going that day. Our day at Magic Kingdom was... MAGICAL! The weather was perfect with sunshine & a high temperature of 78 degrees & 40% humidity! The crowds were - not bad compared to the June crowds we were accustomed to dealing with. We did not have to wait on Disney transportation at all during our trip. We got to do everything we wanted to do, some of it TWICE! Of all our trips to Disney World, this one was the closest to perfect that we experienced. 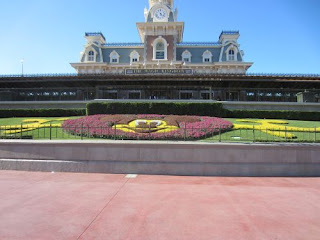 Our day at the park began after a short 12-minute Disney transportation ride from our hotel to Magic Kingdom. We arrived at 7:30 AM & went through bag check & the park entrance. We then waited for the Magic Kingdom Welcome Show to start at 7:45 AM. During the Magic Kingdom Welcome Show, Mickey & the gang came out to open the park. This is a great opportunity to see a variety of characters. The characters open the park from the train station balcony. After the welcome show we enjoyed the Extra Magic Morning hour from 8 AM to 9 AM that is available only to Disney hotel guests. In this time we were able to ride 4 rides including the Seven Dwarfs Mine Train (always try to ride early because the lines get really long during the day), Buzz Lightyear Space Ranger Spin, Tomorrowland Speedway, & the Astro Orbiter. Our first FastPass+ selection started at 9:10 AM so we headed to Adventureland which was vacant at 9:15 AM. We spent the next two hours exploring Adventureland & Frontierland. In the early afternoon we headed back to Tomorrowland & Fantasyland to finish the rides we did not get to during the morning. 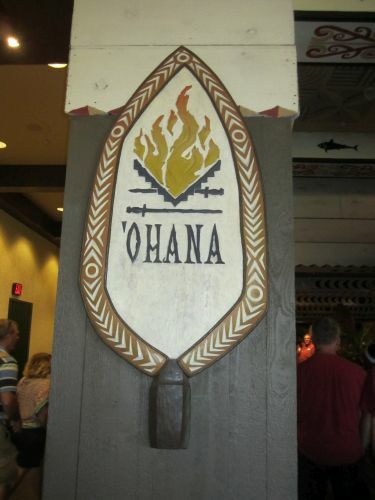 At 3 PM we took a break from Magic Kingdom & rode the monorail to Disney's Polynesian Resort to eat at our favorite restaurant, Ohana. After lunch/dinner at Ohana we took the water launch back to Magic Kingdom. As we entered the park once more we took the time to take pictures down Main Street that we did not take at arrival that morning. This was great because there was not as many people! That evening we explored the park & rode rides until time to pick our spot for the Electric Light Parade at 9 PM. We selected our spot around 8:30 PM that would work both for the Electric Light Parade and also for Wishes Nighttime Spectacular. 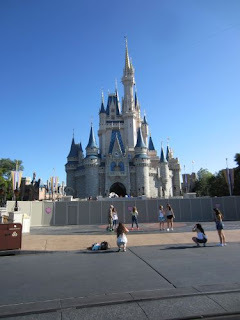 We selected a spot in front of the castle near the entrance to Adventureland that did not have trees blocking the castle. We knew if we tried to pick two different spots it would be difficult to move around in the crowd between the two. Our selection was a good one & we enjoyed seeing both of these not to be missed attractions. 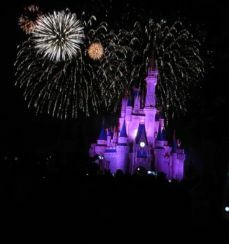 Remember: Magic Kingdom fireworks are not your typical everyday or even July 4th fireworks - you do NOT want to miss the show. Wishes Nighttime Spectacular always makes me cry. 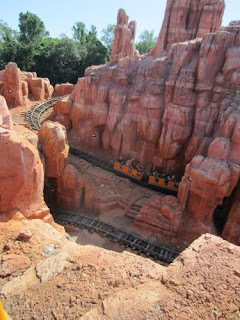 After the fireworks we had one last FastPass+ to cash in at Big Thunder Mountain Railroad for a night time ride. It was a fabulous final ride for a near perfect day! The day was long as we were in Magic Kingdom from 7:30 AM until 11:00 PM. We could have stayed until 12 midnight that night but we were worn out & were ready to get some much needed rest. 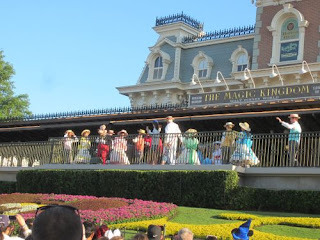 Our day in Magic Kingdom was truly "magical" for our family. From trying to scare each other in the caves of Tom Sawyer Island to seeing who could get the high score on Buzz Lightyear to screaming our heads off on the night time Big Thunder Mountain this day will be remembered always. Our day at Disney Springs & our hotel was... RELAXING. After a long day at Magic Kingdom Friday, relaxing on Saturday was perfect. We awoke and ate the breakfast bars we brought with us on the tables outside of Jackson Square. The morning was brisk but invigorating at 58 degrees. We explored the beautifully landscaped property of Port Orleans while we waited for the boat to Disney Springs to begin service at 10 AM. My son played video games in the Medicine Show Arcade at French Quarter during this time as well. 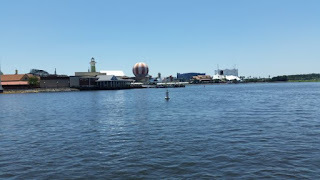 We headed to Disney Springs (formerly Downtown Disney) around 11 AM on the free boat service from our hotel. 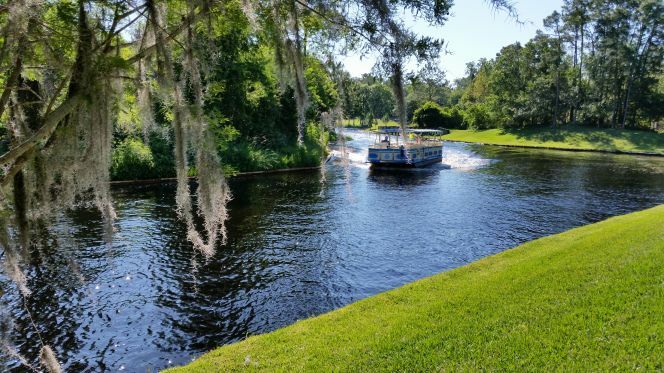 The twenty minute boat ride was a relaxing journey down the Sassagoula River to Disney Springs. At Disney Springs we did a little shopping, had lunch at Raglan Road, & picked up dinner at Earl of Sandwich for heating up later. Disney Springs is not a theme park and therefore there is no admission charge. 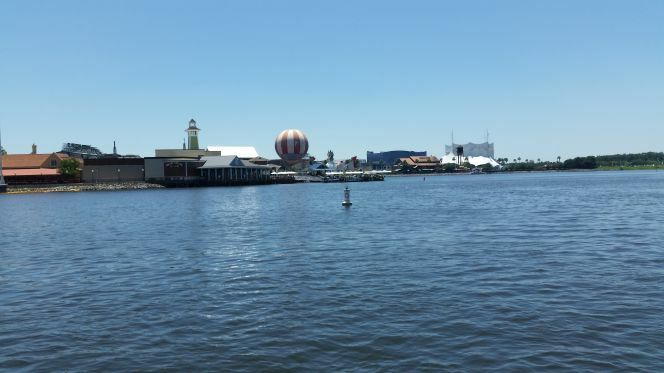 You have a variety of stores, restaurants, theaters, and other activities you can do when you visit Disney Springs. Some of the most popular include: La Nouba - Cirque du Soleil (a great family friendly show), Disney Quest (an indoor interactive theme park with five floors of video games & 3D interactive rides), AMC Disney Springs 24 with Dine-in Theatres (catch a movie while eating at the dine-in theater), Splitsville Luxury Lanes (bowling in the 21st century accompanied by tasty food selections), & Characters in Flight (a 10 minute ride on a tethered hot air balloon). We used Disney's Magical Express for transportation from & to the airport. You do not need to rent a car if you are staying at a Disney hotel & plan to only visit Disney World. This is a great way to save money. Disney's Magical Express will pick you up from the Orlando Airport 24 hours a day 7 days per week. If your plane arrives before 10 PM Magical Express will deliver your checked bags to your room. Disney guests that arrive via plane between 10 PM & 5 AM will have to get their own bags & take them on the bus. You will need to register for Magical Express pickup at least 10 days prior to scheduled arrival. Your booking agent can help you register for pick up at the airport. For return to the Orlando Airport Disney's Magical Express will pick you up at your Disney hotel. You will receive departure information one day prior to scheduled departure in your room. Disney's Magical Express will go to other resorts than just your resort so expect to make stops prior to your hotel. The ride is approximately 35-45 minutes from/to the airport to your resort. We used the FREE Disney transportation exclusively during our stay. Disney World is 40 square miles in size! Disney World theme parks, hotels, etc are not close to one another so transportation is important. Disney transportation includes bus service, boat service, & monorail service. Bus service is available between Disney resorts & theme parks & Disney Springs. You can also use the bus service between theme parks. Boat service is available at select resorts & theme parks. 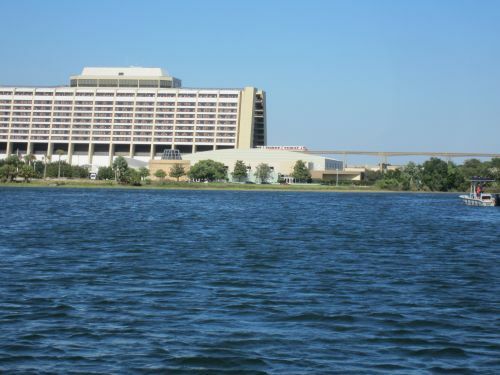 Monorail service runs between Magic Kingdom & the Contemporary, Polynesian, & Grand Floridian hotels. Monorail service is also available between Magic Kingdom & Epcot. You can find out more about the FREE Disney transportation online by clicking here. We relied on Disney transportation during our trip. We took the bus to & from Magic Kingdom. We took the monorail from Magic Kingdom to the Polynesian for lunch/dinner. We took boat service from the Polynesian back to Magic Kingdom. We used the boat service from our resort, Port Orleans French Quarter, to Disney Springs. As luck would have it, we never waited for a bus, boat, or monorail - as close to perfect as can be expected. This is atypical to a visit during the busy summer months. I highly recommend using the FREE Disney transportation to avoid having the hassle of driving, parking, etc. Disney transportation makes your stay all the more MAGICAL! Over the years we have learned that EATING at Disney World is... challenging. You would not think a place such as Disney World that has over 140 restaurants, including sit down restaurants & counter service fast food style restaurants, would be a challenge to find something good to eat. However, I do not like fast food (except Chick-fil-A) when I am not at a theme park. I REALLY don't like fast food when I am at a theme park paying theme park prices! With that being said, we still have to eat so that we can have the energy to stay in the theme parks for hours on in. So how does a family eat & stay within a budget? ** We do NOT purchase the Disney dining plan. The Disney dining plan is available to guests of Disney World hotels where you can pre-pay for all of your meals & snacks. To learn more about Disney dining plan click here. 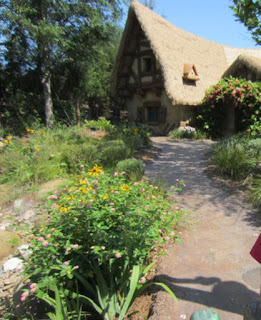 On previous trips to Disney World we have tried the dining plan & without the dining plan. For the needs of my family we save money NOT purchasing the dining plan. In fact on our trip in June 2015 we saved $500 by paying for our meals as we go instead of purchasing the dining plan. However, IF you are a family that wants a dessert every meal AND you eat a snack once per day in addition to your meals then you might want the dining plan. The year we purchased the dining plan, it seemed like all we did was eat - which made it very hard to walk around the theme park in the heat of the summer. Breakfast - To save money we always eat breakfast at our hotel in our room or on the grounds of the hotel. Disney World hotels do not offer complimentary breakfast that mid-priced hotels offer. All Disney World hotels have a restaurant and or food court where you can have breakfast. However, the prices for breakfast cost from $10 & up per person when you include a drink. For this trip I brought along Nutrigrain bars & instant breakfast mix for myself & my husband & pop tarts for my son for the 3 mornings we would be at Disney World. We purchase milk at the hotel store to have with our breakfast. If we stay more days & we drive to Disney World, I will pick up milk at the grocery store before getting to the hotel. However, if you fly to Disney World & are staying for a lengthy stay, you might want to consider getting groceries delivered to your hotel room at sites such as Garden Grocer to save money on food. Ohana Restaurant - Our FAMILY Favorite! 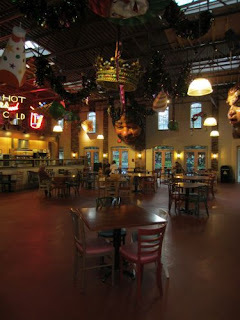 Restaurant which is our favorite restaurant at Disney Springs. It is located near The Landing in the center of Disney Springs. The lunch menu serves a variety of sandwiches as well as entrees. Budget saving tip: the entrees are slightly less expensive if you eat lunch as opposed to dinner. 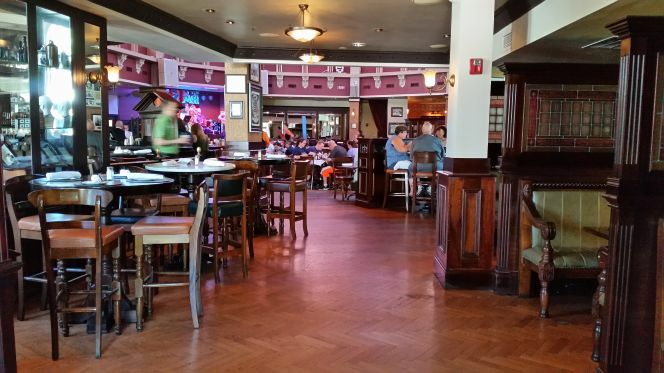 We like Raglan Road because the food is tasty & we enjoy the ambiance as well. The day we visited (Saturday) there was an Irish band & dancers entertaining on the main stage during lunch. Typically entertainment starts at 3 PM. The band & dancers were phenomenal. Audience participation is encouraged & our son was invited up on stage to learn to clog dance. In addition to the clogging lesson, he received an autographed photo for his participation. This was a memorable & fun lunch for our family. For dessert we headed over to Ghirardelli Chocolate at the Marketplace & got a free sample of chocolate. For a family on a budget this was a nice treat! 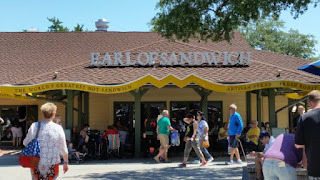 picked up a to go sandwich at Earl of Sandwich when we were in Disney Springs. Earl of Sandwich offers a great selection of soups, salads, & sandwiches at an affordable price. Make sure you join the Earl of Sandwich e-club before you leave for your trip so you can get a FREE sandwich. Hint: put your birthday as being the week of your trip so you will get a free birthday sandwich too. Our hotel room had a refrigerator so we put the sandwiches in it until dinner time. At dinner we heated the sandwiches up in the microwave at the food court of our hotel & ate dinner on an outside table located on the patio near the food court. This was much less expensive & much more tasty than eating the burgers & fries that we could order at the French Quarter food court. I highly recommend Earl of Sandwich for the family on a budget. On this trip we ate some fantastic food while maintaining our budget. 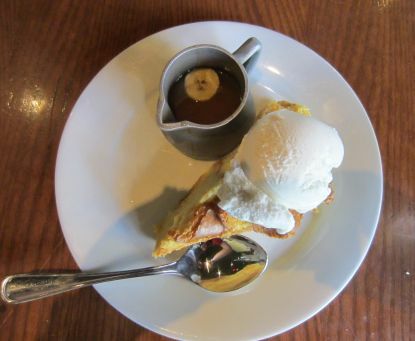 It is possible to eat great while at Disney World! Polynesian, & Grand Floridian Hotels. Some final thoughts about our 2 day trip to Disney World... Often times families do not go on vacation because life gets in the way. I encourage you to take some time while your kids are young and travel - show them the world. Your time to do this is brief - so do not let it pass you by. 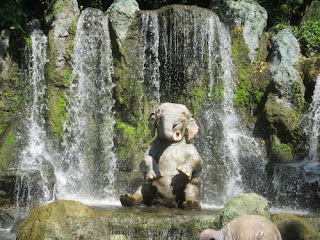 You CAN visit Disney World even if you are on a budget! 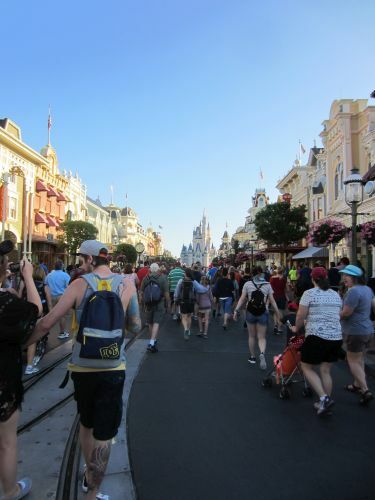 A two day visit to Disney World was within our budget where a seven day visit was not. We had to cut corners by bringing our on breakfast & snacks but because we did that we were able to go to Disney World. You will not regret the lifelong memories you will make on your travels. 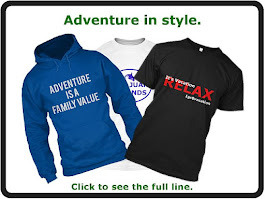 Visit our video link at the top of the page to see footage from our trips. May God bless you on all your adventures!